Nearly 200 people who won a ballot to go down an inflatable water slide have been left disappointed following a financial dispute with the supplier. Organisers of Sunday's event at the Ramsgate Festival said they had been forced to cancel after the supplier pulled out late on Saturday night. Adam Faulkner, director of Bloon, said full payment had not been received. Festival spokeswoman Lorraine Williams said half had been paid and pre-payment of the balance had not been mentioned. "We are devastated," she said. "This money could have been immediately transferred but we have not been able to contact them [Bloon] since they sent that email last night and it is clear now they are not coming. "This is a disaster for us. 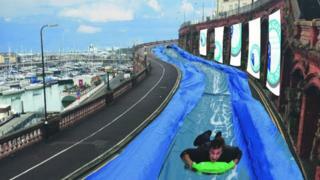 The point of the Ramsgate Slide was to bring joy and fun into the town. "It was something different to draw attention to our fantastic harbour and seafront." More than 5,000 people had entered a draw to slide down the giant inflatable chute, with 180 people, including 40 children, chosen. Ms Williams said everyone awarded a place would be given the opportunity to go down the slide at a future date. "This is our commitment to the town," she added. In a statement, Mr Faulkner said: "Despite several reminders and requests for payment, Ramsgate Arts Festival failed to clear their outstanding balance. "This is against our terms and conditions as there were no credit terms agreed. "As a business we cannot provide goods and services without payment. The balance still remains outstanding."